What happens if Motley doesn't return? Motley, Baylor's 6-10 all-Big 12 forward, didn't want to talk about his NBA decision after the loss Friday to South Carolina. But with projections suggesting he'll go somewhere in the first round, it makes a lot of business sense for him to go pro as a redshirt junior. Motley was a dynamic double-double machine. Opponents built their defensive schemes around him. Expect a more balanced approach offensively with more of focus on the perimeter if Motley leaves. Because Wainright's talents usually didn't translate to scoring, his many contributions sometimes got overlooked outside the program. He was the quintessential senior glue guy that successful teams need, and set the tone in the locker room throughout the season. He leaves a large void and not an easy one to fill. The 7-foot Lual-Acuil developed into a highly effective rim protector, leading the Big 12 in blocked shots and was effect working close to the basket. Slender and athletic, he could be become an even bigger component if he can bulk up and develop a variety of low-post moves. Can Lecomte be an elite point guard? In a word, probably. He's definitely looked the part at times especially when Baylor started quickly. When Lecomte suffered a sprained left ankle late in the season, his value quickly became apparent. He still has bouts of inconsistency and is capable of high-turnover games against aggressive defenses. But with Frank Mason III, Monte Morris and Jawun Evans all leaving, Lecomte is poised to take the next step in the Big 12. With Wainright and (probably) Motley departing, Baylor will have to find replacements for two starters. Credit coach Scott Drew with having laid a solid foundation for things to fall into place. Red-shirt freshmen Tyson Jolly and Mark Vital are former top 100 national recruits and should be ready. At 6-9, incoming freshman Tristan Clark will bring size and depth up front. Frank Martin and the South Carolina Gamecocks brought an intensity that Scott Drew’s Baylor Bears could never match. Baylor’s defense was good enough to win this one, but South Carolina’s was good enough to win running away. All night long the Gamecock defense stifled every attempt, playing with control and fluidity. They were on a string, and Drew couldn’t find a way to snip it. Johnathan Motley (18 points, 9 rebounds on 8-17 FG), who has found the open man all season long when faced with double teams, couldn’t adjust to the defenses he was seeing. South Carolina’s help defender would sink into the paint, while the defender left on the weak side would sit comfortably between the two Baylor players standing too close together. The Bears needed to space the floor and spread the defense out to find the open man. Instead, they moved into the paint - maybe to make themselves more available or visible - and allowed the defense to pack in and contest everything. Even Manu Lecomte, Ish Wainright, and Jake Lindsey had their vision shuttered. Baylor had little trouble getting the ball into the paint, but they couldn’t do anything once it got there. On the other side, Sindarius Thornwell was a beast. Shooting 4-10 from outside, he posted 24 points, 6 rebounds, 2 assists, 2 steals, and 2 blocks. He was everywhere any everything for his team. Three other Gamecocks reached double figures as South Carolina shot 46% from the field as a team. Baylor shot 25% in the first half. That pretty much tells you how South Carolina had a 15 point lead having scored a mere 37 first half points. The Gamecocks were suffocating on defense, causing the slowest, most agonizing 18-0 run in NCAA Tournament history. South Carolina’s help defense was outstanding. Anytime the ball went inside, defenders were swarming to the ball, obscuring passing lanes and forcing poor shot choices. For Baylor’s part, they missed some open shooters. The skip passes to force hasty rotations were there, but Lecomte, Motley, et al. didn’t see them. Instead, Baylor settled for heavily contested midrange shots. Typically, even that’s okay offense for the Bears with their offensive rebounding. South Carolina, however, crashed the defensive glass so hard that even the occasional OREB lead to nothing more than an errant tap. Thornwell was everywhere in the first half. Shooting 3-8 from the floor, he tallied 10 points, 2 rebounds, 2 assists, 2 steals, and 1 block. With 4-9 shooting from outside as a whole for South Carolina, they looked like gangbusters compared to the Bears. With upsets of the top two seeds in its region, Baylor’s path looked to be opening up to the Elite Eight and beyond. Reaching the Sweet Sixteen was certainly in step with an excellent regular season, but the Bears seemed lost from the opening tip tonight. For Motley and Wainright - who likely both played their final collegiate game tonight - it is a tough way to go out. Perhaps this convinces Motley not to go to the draft, but that remains to be seen. The season was magical, the potential out coming was tantalizing, but the grapes were yanked from reach here at the end. We’ll still remember this team for a long time. Sic’em, Bears. 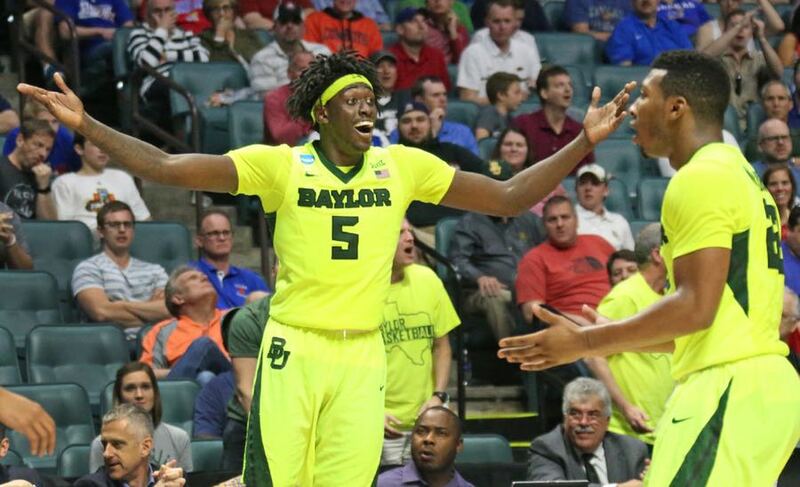 OKLAHOMA CITY, Okla. - By any objective measure, Nina Davis' career at Baylor can only be labeled as a success. An undersized, under-recruited post player, Davis has seen the highs of Big 12 championships, All-Big 12 and All-America honors and four Elite Eight berths. But the emotional scars she wears, along with the rest of Baylor's experienced players, stem from how each of the past three seasons have ended. In 2014, it was a loss on an undefeated Notre Dame team's home court. In 2015, it was a long-awaited rematch with the Fighting Irish in Oklahoma City that got away in the final minutes. Last year, it was a down-to-the-wire slugfest in Dallas that went Oregon State's way. The only hole on Davis and the top-seeded Lady Bears' resume during that time is the lack of a Final Four trip, and they have another chance to clear the last remaining hurdle when they meet No. 2 seed Mississippi State at 6:30 p.m. Sunday at Chesapeake Energy Arena. How Baylor deals with the emotions of being back in the Elite Eight for the fourth straight season could go a long way in determining its fate against the Bulldogs. "I think it starts with the seniors," Davis said. "Us being here for four years now, we've been here, we've done it before. We for sure know we've been stopped here three years in a row, and we know you can't get too high for these moments and you can't get too low. It's our responsibility as leaders of the team to keep our team in check and let them know this is what we've been working for all year. We've been granted with another opportunity, and we've got to take advantage of it." The Bulldogs are unburdened with Elite Eight shortcomings. After all, this is the first time they've been this far. Former Texas A&M assistant Vic Schaefer has taken Mississippi State from a 13-17 record in his first year to four straight 20-win seasons. The Bulldogs have posted a new school record for wins in each of the past three seasons, including a 32-4 mark this year. "We're just so excited," said 5-7 junior guard Blair Schaefer, the coach's daughter. "Our program has never gotten to the Elite Eight before, and so we were just so happy for each other (after winning the Sweet 16 game against Washington). It was such a great team win ... so getting back to the locker room was just a huge team celebration." It was business as usual in the Baylor locker room, and the Lady Bears (33-3) know Mississippi State presents a difficult challenge. Part of that is because Mississippi State has a player who can not only look Baylor's 6-foot-7 Kalani Brown in the eyes, but has the talent to compete with her, too. That's Teaira McCowan, a 6-7 sophomore from Brenham, Texas, who scored 26 points, pulled down 12 rebounds and swatted six shots in the Bulldogs' win over Washington on Friday night. "I'm familiar with Teaira. I've seen her on the AAU circuit, and she's gotten better," Brown said. "I don't know if they're going to double-team me, because of the size they have. I would doubt if I see double-teams. Hopefully, it's a straight man matchup, guard-to-guard, post-to-post." Baylor coach Kim Mulkey is familiar with Mississippi State's style of defense from Schaefer's days at Texas A&M. The Lady Bears expect pressure all over the court to go with the Bulldogs' size in the post. But, while much of the focus has been on the post matchup, both teams have capable guards that will also have a say in the outcome. Baylor is leading the nation in 3-point shooting percentage, thanks in large part to the double teams that come crashing down into the post. "I think people forget how good our guards are," Davis said. "Because of the size we have inside, they get overlooked. We have to feed off each other. If they double us, we have to kick it out to them for the open shots and vice versa. So, we definitely feed off each other, and it's been working all year long." Mississippi State's backcourt is led by Victoria Vivians, a 6-1 matchup nightmare for most teams who averages 16.1 points per game. She's joined by 5-5 junior guard Morgan William (10.1 ppg) and a pair of relentless competitors in and her 10.1 points on average, and a pair of relentless competitors in Dominique Dillingham and Oklahoma State transfer Roshunda Johnson. The assignment of guarding Vivians will likely fall to Alexis Prince, who has overcome a string of injuries to play some of the best ball of her five-year Baylor career this season on both ends of the floor. "I take every game as a challenge, (a chance) to challenge myself," said Prince, a 6-2 senior who averages 12.2 points and 4.7 rebounds. "What can I do this game to help my team? What can I do to make a play? Earlier this year I wasn't scoring like I am now, so I just tried to do something to help contribute in any way. I took it as a challenge to use my length and (defense) as something to get better at." Prince said some perspective has been gained by watching the freshmen celebrate the run they are on, and has helped the older players from getting too uptight. The Lady Bears are also pleased to be playing in a place they know well, even if it hasn't always been the friendliest of confines. "We've had a lot of ups and downs in this arena," said Davis, averaging 12.8 points and 5.7 rebounds. "I've celebrated in confetti, and I've cried in this exact locker room. But you don't really think about those things. We're very familiar with Oklahoma City, and we're not worrying about where we're playing. We're worrying about our opponent and our goal of getting to the Final Four." 0 Response to "Baylor men's basketball's five biggest issues this offseason"